Ultimate Blue Solar Pool Heating is the latest in solar pool heating products. Ultimate Blue comes in standard black colour and in Venetian Blue split colour profiles. Ultimate Blue solar gets its name from the co extrusion process and internal blue colouring that is seen in the internal part of the tube. With a tough 15 year warranty when installed with the Tufman® range of products, Ultimate Blue solar is sure to heat any pool for a long time to come. Talk with one our consultants about the right amount of coverage for your pool. Ultimate Blue solar comes in a 10 Tube profile; there are many types of solar profiles in the market today and many designs use old or out dated technology. Ultimate Blue solar pool heating is made using a co extrusion technique and the process was invented right here and the PVC Nitrile blended materials we use are made for our tough weather conditions. Venetian Solar pool heating uses the same technology as Ultimate Blue Solar however Venetian Solar comes in a full range of Colorbond colours. 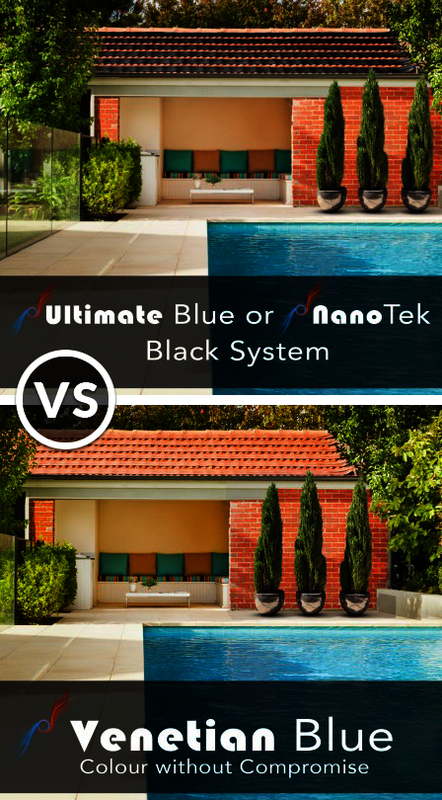 The split colour technology allows you to see the solar colour matching your roof from the ground but shows black to the sky which means you get a great looking solar pool heating system without compromising your pool heating. Venetian Solar also comes with full options for pipe covers so you won’t even see the pvc pipe on the roof that hooks up to your Venetian Solar pool heating.